David Ortiz retired from the Boston Red Sox last year as one of the most successful baseball players in Sox history – and one of the most beloved. 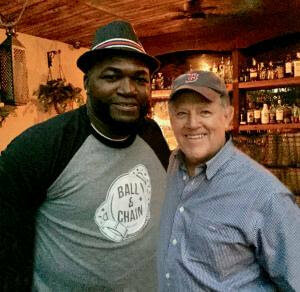 I met Big Papi several weeks ago in the Little Havana section of Miami. He is filming a Fusion TV series entitled Big Papi Needs a Job. He retired at 40 – famous and well off. The premise of the series is answering the question “What job should Big Papi have now?” Ortiz will try everything from making beer to being a manicurist. We think “what do we do now?” when approaching retirement. But there are other points in our lives when seriously asking that question can change our lives in important ways. This is more than a mid-life crises question where the guy buys a red sports car, and all is well. Our lives can be richer and more satisfying if we pause at possible inflection points like these and ask – what do we want the next phase of our life to be? Designing Your Life is a terrific best seller by Bill Burnett and Dave Evans outlining how to work through this question. Interesting, fun read with a well defined process for getting beyond our conventional thinking and trying different paths before making big commitments. Check it out. Could change your life.